With less than one month to go before the launch of Space Shuttle Atlantis’ flagship mission to service the Hubble Space Telescope (HST), NASA managers are busy reviewing final statistics and analyses of the threat posed to Atlantis by Micro-Meteoroid Orbiting Debris (MMOD). With the MOD FRR (Mission Operations Directorate Flight Readiness Review) complete, the bulk of discussion regarding MMOD will take place next week during the Space Shuttle Program FRR (April 20-21) and the SOMD FRR on April 30. With the unique nature of Atlantis’ STS-125 mission in prime focus for NASA managers, of particular interest – mainly the increase of orbital debris concentration at the mission’s altitude – is the region of Low Earth Orbit Atlantis will fly in for the majority of her mission. Originally analyzed last September ahead of the original STS-125 launch date, the all-powerful Program Requirements Control Board (PRCB) has re-evaluated the threat posed to Atlantis and her seven member crew by MMOD. The new results, which take into account recent satellite breakups and a variety of other components, show that the overall risk of a Loss Of Crew and Vehicle (LOCV) scenario due to MMOD impact(s) to the Thermal Protect System (TPS) is 1 in 185 – the exact same ratio as the original assessment back in September. NASA analysts were able to reach this particular ratio by making use of the known probability of detecting and repairing critical TPS damage while on orbit, the “IDC of RCC panels 8-11,” the flight’s mission duration and the Orbit Adjust maneuver post-HST release, and the STS-400 rescue mission. However, as defined by NASA guidelines, the Space Shuttle Program cannot accept a LOCV ratio in excess of 1 in 200. Since the STS-125 LOCV ratio is 1 in 185, the final decision on whether or not this ratio is acceptable will be discussed during the SOMD FRR on April 30 – at which it is anticipated that this LOCV risk will be accepted for STS-125. On the other hand, the MMOD LOCV ratio for the STS-400 rescue flight is 1 in 294 – with late-inspection of the Wing Leading Edge (WLE) panels and Nose Cap on FD-5 and a short mission duration of seven days driving the calculations. 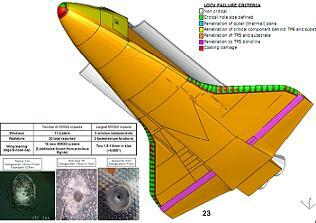 If the STS-400 crew does not perform any TPS inspection, the LOCV ratio rises to 1 in 217. The PRCB presentation goes on to note that the LOCV ratios for STS-125 and STS-400 have an error factor of 1.35 based on MMOD distribution, velocity, and density uncertainties. 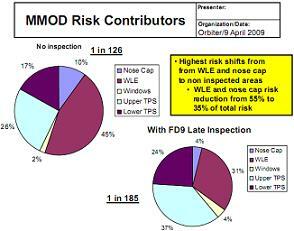 For the original October 2008 launch date of STS-125, NASA determined the overall MMOD risk to be 1 in 185. In formulating this ratio, NASA determined that the now standard late-inspection of the Orbiter’s TPS would reduce the MMOD threat by 37 percent and that altering Atlantis’ orbit after the TPS late-inspection so the perigee would be 160NM would further reduce the MMOD threat by 6 percent. Furthermore, the mission was “designed (timeline, attitudes, TPS Inspections, etc.) to minimize critical TPS exposure to MMOD while staying within the HST systems operational constraints,” notes the expansive PRCB presentation available for download on L2. Additional elements taken into consideration were: protecting the HST’s aft shroud and Orbital Replacement Units from direct sunlight during the mission’s EVAs, maintaining a “Payload Bay to Earth” orientation as much as possible, and minimizing EVA and Orbiter MMOD exposure. All of these assessments and mission design elements remain unchanged for the now-planned May 12 launch. However, as the presentation notes, the MMOD environment has changed since October. These breakups include the Chinese ASAT/Fengyun 1C, the Kosmos 2421, and the Kosmos 2251/Iridium 33 satellite collision – all of which respectively account for 27 percent, 1 percent, and 71 percent of the total orbital debris flux increase. 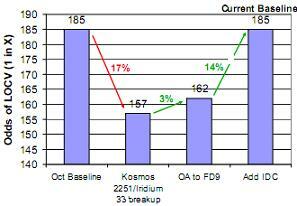 These satellite breakups themselves resulted in an increase of the MMOD LOCV risk to 1 in 157 for Atlantis. However, given the lengthy delay to STS-125, mission planners were able to investigate and baseline several new MMOD mitigation tactics. The first change to the mission’s timeline relates to the FD-9 activities. Instead of performing the late-inspection of Atlantis’ WLE panels and Nose Cap on FD-9 and then adjusting Atlantis’ orbit on FD-10, both activities will now be performed on FD-9. “Moving the Orbit Adjust maneuver to FD-9 reduces the MMOD risk by an additional 3 percent,” notes the presentation. Moreover, IDC imagery of the Atlantis’ RCC panels 8-11 will further reduce the MMOD risk by 14 percent as the lower surfaces of RCC panels 8-11 have the tightest failure criteria. With these mitigations, as well as a few others which are not mentioned in the presentation, the overall MMOD LOCV risk for a May launch of STS-125 is the same as it was for October: 1 in 185. In addition to the already baselined MMOD mitigation tools, mission managers are continuing to assess other mitigation options. The first alternative mentioned in the PRCB presentation is the option of delaying the TPS late-inspection by 15 hours, thereby pushing the activity into FD-10. This would result in an approximate risk reduction of 3 percent to 1 in 190. Nevertheless, the effect this delay would have on imagery review and repair operations has not been assessed. This, however, is the last risk reduction option that would not involve shortening the mission. The three remaining options all involve the deletion of mission content or crew off duty time. These options include eliminating one EVA day (which would reduce risk by ~6 percent to 1 in 196), eliminating two EVA days (which would reduce risk by ~12 percent to 1 in 208), and eliminating the crew off duty day post-HST release (which would reduce risk to 1 in 201). Whether or not any of these options are added to the mission’s timeline, work to prepare the STS-125 mission for flight is in full swing, with the STS-125 mission’s payload scheduled to be delivered to Pad-A later this week and STS-400 rescue vehicle scheduled to take her place atop Launch Pad 39-B Friday morning.